This week’s number in the real world is: dates, and more specifically the “year” part of a date as is used in coin production. Here’s a penny that has a year of “1976.” If coins didn’t have the year stamp on them, no one would know when the coin was produced, and don’t we want to know that? Of course we do! Did you know the average life span of a coin is 25 years? This coin is 37 years old. This coin has beaten the odds. Why is that? Maybe because it’s been holed away in a blue tin for 25 years. When my son was born 25 years ago, my Grandma and Grandpa Wagner brought him a gift. This gift was very a blue tin. It was very heavy. Billy couldn’t lift it. Billy’s mom could barely lift it. But of course, Billy’s Great Grandpa Wagner could lift it. You don’t spend your life on a farm and in the oil fields without developing strong arm muscles. 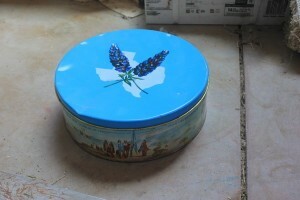 In this blue tin was something special. 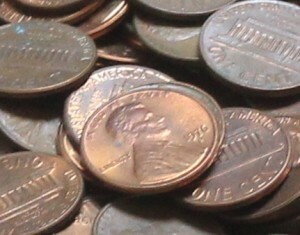 Pennies! Five thousand pennies!! Oh sure, the gift would have been better (and lighter) if it was five thousand one dollar bills, but it’s the thought that counts. Ha! Ha! I’m just joking. Of course this is a fabulous gift because it represents my grandma and grandpa. And when my son was born, they took the time to drive to the bank, hand 50 dollars to the teller, and request 5000 worth of pennies. One day — is that day now?? — pennies will be obsolete. But these pennies are worth hanging on to — because they’re not just pennies, they’re memories — memories of a bygone era when grandmas and grandpas had to work long hard hours for not much more than a few pennies. Oh, and how heavy is this tin with fifty dollars worth of pennies? About 35 pounds. 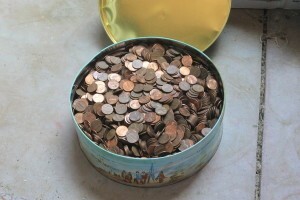 Years, penny counts, and pounds — 1975; 5,000; 35 — good numbers that sum up a good memory.